Austrian Gold Coronas are an essential buy for serious collectors and a smart option for investors. These striking gold coins are linked to the history of the Austro-Hungarian Empire and feature the Imperial coat of arms and a portrait of the Emperor. The Gold Krone, Korona or Corona was the Austro-Hungarian Empire's official currency from 1892 when it replaced the Gulden. The last legal tender Gold Coronas were struck by the Austrian State Mint in 1915. However, in line with Austrian tradition, commemorative coins were issued from 1916 following the death of Emperor Franz Josef I. All re-strikes bear the date 1915 and contain 900/1000 fine gold – and they're VAT Free at coininvest.com. The historic prestige of the Austro-Hungarian Krone makes these gold bullion coins an essential part of any serious coin collection. With an exquisite design and a gold content of .9802, the Krone is recognized as a valuable asset all over the world. The Austrian Krone Gold is available for purchase from the CoinInvest online store. Simply select the coin of your choice to take you through to the product description page where you can learn more about the individual coins and once you have decided to purchase add to your cart by clicking on the orange stripe. The Gold Krone (German, also referred to as Korona or Corona in Hungarian) was the official currency of the Austro-Hungarian Empire from 1892 when it replaced the Gulden. It remained part of the gold standard until 1915. After Emperor Franz Joseph I died, commemorative coins were struck in line with Austrian tradition. After several earlier attempts, the Austro-Hungarian Empire adopted the gold standard in 1892. This plan included the introduction of the new currency, the Krone. Gold Kronen were of .900 (21.6 carat) purity and were first issued for circulation in the 10 and 20 Kronen denominations, while the 100 Kronen gold coin was first struck in 1908 and until 1914 inclusive.10 Kronen coins were struck until 1912, while the last legal tender Krone coin was struck in 1915, which is also the date on all re-strikes that were issued the following years. The portrait of His Majesty the Emperor adorns all Kronen coins. When revolution spread to the capitals of the Austrian Empire in 1848, Franz Joseph was proclaimed emperor of the empire after the abdication of his uncle Ferdinand I who died without leaving an heir. In the period 1908–14 Franz Joseph held fast to his peace policy. Yet, following the assassination of his nephew Archduke Franz Ferdinand at the hands of Serbian nationalist, Gavrilo Princip, Franz Joseph was persuaded to issue the intransigent ultimatum to Serbiain July 1914; this action led to World War I. Toward the end of his life, Franz Joseph I became a universally revered man, a monarch that for all his defects and insufficiencies held together the rotting structure of the multinational state. Gold Kronen contain 90 % pure gold, the balance being in silver. On the obverse side we find the portrait of Franz Josef I. 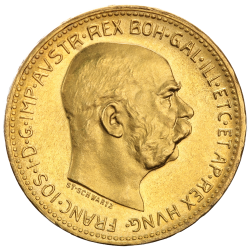 There are versions featuring a younger portrait, where the Emperor is bearded with a thick moustache and wearing a laurel wreath on his head, and a more mature depiction on the 100 Krone coins, including the 1915 re-strike issue. The Emperor is facing right, while the words FRANC IOS I D G IMP AUSTR REX BOH GAL ILL ET AP REX HUNG are inscribed all around. On the reverse we see the arms of Austria overlaid upon a crowned double-headed Imperial eagle. The coat of arms of Austria-Hungary was the country's symbol during its existence from 1867 to 1918 when the empire collapsed as a result of defeat in World War I. Atop the Imperial Eagle is the Imperial Crown worn by Holy Roman Emperors from the House of Habsburg. The Imperial Eagle holds the Imperial Regalia or the crown jewels, the Imperial Sword, which was used during coronations, and the Imperial Orb, a symbol of divine right. In Byzantine heraldry, the two heads represent the Emperor having authority over both secular and religious matters, and facing both East and West for friend of foe. Inscribed we find the word CORONAE, together with the denomination of the coin and the year of issue also inscribed in Latin numbers. The Austrian Mint is one of the oldest institutions in Europe and has been producing innovative coinage and currency for over 800 years, carrying out both design and minting processes of the coins it produces. Right from the outset the expert craftsmanship of the Vienna Mint played a vital role in the production of prestigious and timeless coins of the very highest standard. The engraving academy has been in existence since 1733 in Vienna and miniature works of art are still being created by its highly gifted and experienced designers. The gold Kronen exquisitely crafted coins are minted in the very heart of Vienna and are highly sought after by investors and collectors all over the world. These extremely attractive pieces of gold, issued by one of the oldest and finest mints in the world, offer exceptional value for their high purity in fine gold. They carry two great symbols of the Austro-Hungarian Empire, the portrait of the Emperor and the Imperial coat of arms. Coins that were in circulation fetch high prices, depending on their condition, while the 1915 re-strikes are a great investment as they also serve commemorative purposes being linked to the history of the Austria-Hungary Empire. CoinInvest GmbH are one of the leading gold bullion coin dealers in Europe and are happy to hear from anybody with Austrian-Hungarian Kronen for sale. If you are in possession of any gold bullion contact a member of our friendly team who will happily prepare a quote on your behalf based on current market value. We promise to make a highly competitive offer based on current spot prices and will confirm a fixed price via email.